Mollie was the second child that I was asked to help by the charity REACH. Mollie who is thirteen was missing her fingers on her right hand, and had a partial thumb. After discussions with her and her parents, we considered a thumb-less Phoenix Hand, but on Mollies input decided to use a standard hand. The day that I delivered Isabella's arm I decided to drop in to see Mollie with some test parts to check the measurements to get the best fit possible. Mollie requested a pink and purple hand. She told me that she would like to have her hand ready before going on holiday. So I worked late every night to get Mollies hand ready for her. On this hand I decided to test my newly designed reverse dovetail gauntlet, with a newly designed custom 3 pin tensioner box, which allows for a better adaptive grip. When ready I completed a 200 mile round trip to deliver and fit the hand. Mollie had never had a prosthetic before, and within minutes of putting on her hand she was going around picking everything up she could. She couldn't wait to show all her friends. Mollie's smile made all the late nights worth it. It was one of the best days ever. 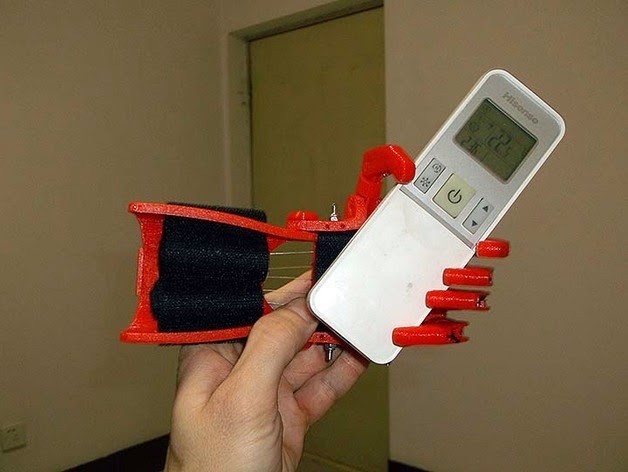 For some time several e-NABLER’s have been experimenting with a way of achieving adaptive grip on devices. Adaptive grip allows a degree of independence in the individual finger actions, thus if one finger starts to grip the other fingers can still continue to move to help improve that grip. To date these excellent developments have been based on the use of a whipple tree design. Myself and Stephen had built these devices but for reason unknown neither of us had managed to get the same level of adaptive grip as other people were able to re-produce. Fellow e-NABLER from France Theirry Oquidam posted a picture of a rapor hand which he had wired the fingers 1&2 and 3&4 by lopping them through the tensioner pin and back to the other digit, creating a simple adaptive grip. This idea sounded almost to simple to work, but Stephen and myself though its worth trying out. Stephen quickly created a 3 pin tension block to use on our Reverse Dovetail Gauntlet to test, at the same time we both created tension pins with a rounded internal surface to help the tendons move freely through them. A quick print later and we gave this idea a test; and it worked really well. I'm sure a more complex Whipple tree gives a better adaptive grip, but given the simplicity with this Stephen and myself have decided to stick with this design for the moment. To date both Mollie and Abbi have received devices with this modification for them to evaluate. We look forward to their feedback and also releasing this back to the e-NABLE community for all to re-use / progress. For anyone who wants to test this out, the files are HERE.